Tonight at Amnesia is the last night for all the cocooners! The great show of Sven Vath, that in summer 2013 returned to be “the show” of Monday night, returns for the last party! And for the final night the line up included top Djs! With Sven Vath will play Ricardo Villalobos, Mathias Kaden, Ilario Alicante, Tobi Neumann, Raresh. Are you ready for the last unforgettable monday? We wish to tell thank you to Sven Vath and his friends for the great season 2013! Tonight, at Pacha, Dirty Dutch! Tonight, at Pacha, retruns one of the coolest party of the season: Dirty Dutch! In consolle will play Chuckie, Danny Howard, Gregori Klosman and Glowinthedark! A great line up for a super monday night in one of the best locations of Ibiza! even if the season is finishing..it’s finishing in the best way! We love space! Tonight the closing party! Tonight at Space will be celebrated the closing party of “We love space”! The show of Sunday night will close after another successful season… and for the closing party will play an unforgettable line up! 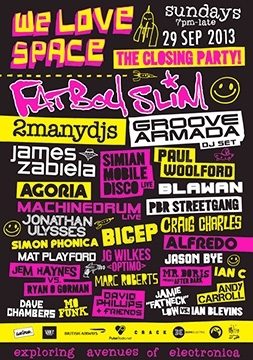 The legendary Fat Boy Slim, Groove Armada Dj set, 2manydjs, James Zabiela, Alfredo and many more! Here you have the poster of the event with the complete program! For further infos and costs: http://www.spaceibiza.com. Many thanks to Guadalupe Revuelta/Ladypress for the support! Tonight..Solomun + 1 at Pacha! Tonight Solomun returns to Pacha with a new episode of the successful saga of “Solomun + 1” ! Solomun, after the brilliant result of Dj awards 2013 (compliments from the team of Ibiza by night) presents tonight as guest Dj Hell! Solomun + 1 has been one of the most creative and innovative shows of Ibiza for summer 2013, presented an exclusive sound and also tonight, be sure, it will be a great party! Tonight, Hotel pacha, Gaty Lopez and Joan Ribas! Tonight, starting at 23, Gaty Lopez presents at hotel Pacha (El Hotel): “Love and music”.. the show of Sunday night! During the night will play Gaty Lopez an Italian Dj and producer based in Ibiza, and “the master” Joan Ribas! The entry is free, and it will be a night of brilliant and elegant music in the exclusive atmosphere of Hotel Pacha! Today.. starting at 12.00 am till midnight… will be celebrated the closing party of Ants at Ushuaia! Ants has be the most intriguing and innovative show of Saturday in ibiza, with different sound, from underground to innovative funky, great performances and the surprise of Andrea Oliva, surely one of the best dj in summer 2013 in ibiza! For the closing party Ants will present a super line up! In consolle will play Onno, Los Suruba, Just Be, Reboot, Timo Maas, deetron..and then the great final with Andrea Oliva! So, dear Ants.. thanks a lot for this amazing season..we’ll miss you a lot! Tonight… Next Level is back at Moma! 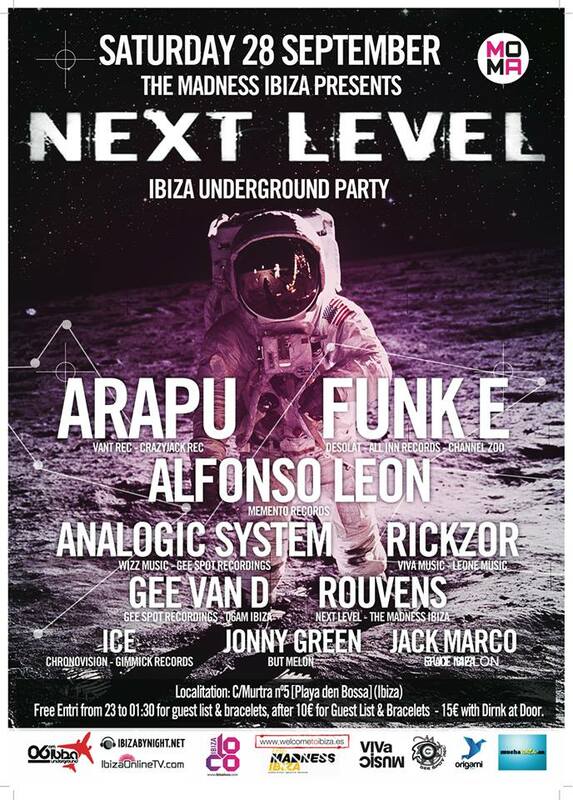 Tonight, at Moma (Playa d’en Bossa) , next level, the cult underground party is back! Free entry from 23,00 till 1,30!